The Star’s Millers man, Paul Davis, delivers his verdict on the performances at Spotland. Assured. Crucial diving punch away just before half-time when Ian Henderson was about to pull the trigger on Steven Davies’ cross. Unhurried and solid. Does the right thing and takes up the right positions. His best game for a month. No-one doubts he can play. Here, the physicality and doggedness were there too. 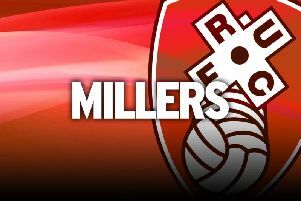 Wrecking Ball scored the winner and organised Rotherham’s best defensive display of the season. A leader. Stuck to his task well and Rochdale right-flank dangerman Matty Done was taken off. Class and composure. King Kieffer is grabbing the headlines but Potter has also been a brilliant summer signing. Has a Premier League touch. Unlucky not to score. Creative in attack and doesn’t shirk in defence. A tireless worker. His corner set up Richard Wood’s winner. Off in the third minute. Fingers crossed the injury isn’t serious. Always a threat in possession. Dale had to resort to fouling him. Effective and full of effort. Not his greatest day but still gave the Dale defence plenty of trouble. On very early for Lee Frecklington and competed well throughout. An 88th-minute replacement for Anthony Forde as Rotherham made sure they saw out the game. Used in time added on when Kieffer could do no Moore. Subs not used: Price, Emmanuel, Ball, Yates. ROCHDALE (4-2-1-3): Lillis 7; Daniels 7, McGahey 6, McNulty 6, Bunney 6; Camps 5 (Inman 71) Williams 6; Rathbone 5 (Andrew 61, 6); Done 6 (Slew 81), Davies 7, Henderson 6. Subs not used: Rafferty, Ntlhe, Williams, Moore. Referee: David Coote (Nottinghamshire) 8.